It is fairly logical to state that measuring the results of your efforts is the first step towards figuring out what you need to do to achieve even better results in the future. However, there are things that are not always measurable or are very hard to measure. According to Forbes, ITSMA and Vision Edge Marketing found out that only 26% of marketers can measure and precisely pinpoint how their actions affected their business. The rest are just guessing whether a specific campaign had any impact on their results or not. The same applies to measure the link building ROI, which is a legitimately hard task to do. The reason behind this is that there are different ways to measure it and the choice depends on the goals that you want to achieve with building the links. And even if you end up with some numbers that indicate success or failure, who’s responsibility will that be? Is it going to get pinned on the link builder or the actual content? There are some tactics that are widely used when it comes to measuring ROI from link building, and they are grouped into three clusters. One of the common ways to see how much your link building campaign is effective is to find out how it’s ranking. The word “rankings” refers to the position that you hold in the search engines for the keywords that you’re optimizing. You must have had the experience that once you can’t find something on the first page of Google, you just give up in your intention to keep searching. That is exactly why, how your page ranks, is very important. Approximately 73% of all organic clicks happen on the first page, while the second and the third page hold around 5% of the clicks. Moreover, the first five results on the first page take away more than 67% of all the clicks! The most relevant point when it comes to how your page ranks are your metadata description and how relevant it is to the keywords that people put in the search bar. This doesn’t mean that the first ranking pages will be the most relevant. For example, if you search on Google “how to fix my lawnmower engine” you might find the relevant meta description under the first five rankings. This means that rankings, although very helpful, are not enough to base your success on. How to track your rankings? There are plenty of tools out there that will help you with tracking your rankings. And probably most of them will do a good job. What many people don’t know is that you can also track your ranking with Google Analytics if you customize it in a way that it tracks the keyword rankings. The platform will provide you with some pretty useful metrics, and the added bonus is that it’s completely free. But how do you use Google Analytics to track your rankings? There is more than one way to use Google Analytics to track the rankings. We’re going to explain one of them. The output of the filter will tell you the Landing Page, User Defined Value (rank), Visits, Pages/Visit, and the Average Visit Duration. Having more traffic on your page is connected to selling more of whatever it is that you’re selling. And this is a very important part of having a website in the first place. If there is no traffic on your page, it means there are no potential buyers interested in your business. Even if you have no experience in the subject at all, you’ve probably heard that more traffic = better business. This is true, at least to some extent. Most of the marketers will advocate this, and if you just do a little bit of research on the topic, you will find plenty of articles on how to increase traffic, how to rank higher on Google so you can increase the traffic, etc. The simple logic behind this is that the more people see what you’re offering, the more potential customers you have. However, traffic on its own is not as relevant as when it’s combined with a much more important thing- conversion. Conversion refers to how many of the potential customers convert to actual customers. For instance, if you have 1000 visitors per day and the conversion rate is 1%, it would be better to have 100 visitors with a conversion rate of 20%. This means that traffic on its own might not actually mean as much as when you consider how many of the people got convinced to purchase your product or service. But still, you can utilize your non-paying visits and use them. How to track your traffic? Some metrics about your site’s traffic are very valuable for you to be aware of in order to know which aspect of your site to improve. Metrics such as the number of total visitors, the number of first-time visitors, the number of page views and pages per visit, the average visit length, the bounce rate and many more. Google Analytics comes in handy for handling all these metrics and more. The first step you need to do is log into your Google Analytics account. Then, go to Behavior > Site Content. For the next step, you can select if you want to inspect the traffic sources on your website’s pages, the landing pages, or the exit pages. Let’s say you want to inspect the landing pages’ traffic sources since they are very important. Landing pages are the pages that many visitors “land on” when they are visiting your webpage for the first time. At this point, you will be able to see a list of the landing pages on your site and the sources where the visitors were before they clicked on your page, which was the medium to your website. 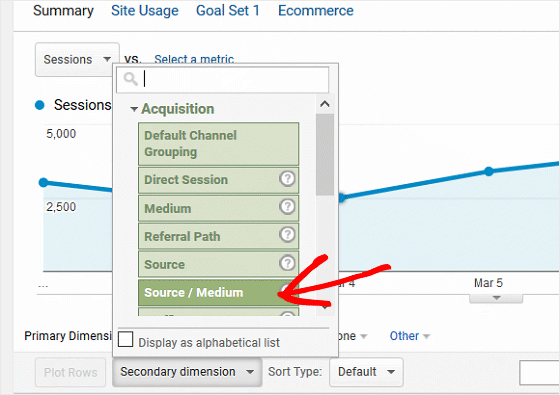 If you want to know more about these sources, Google Analytics segments can break them down into direct, organic, and referral traffic. In this day and age, social media is a big part of almost everything we do. The same applies to link building. However, determining ROI through social media is difficult due to the indirect links used. The links that people share are not easily traceable, so their worth can’t be correctly appraised. Fortunately, Google Analytics can help out in this area too. How to track ROI through social media with Google Analytics? After typing this in the source field, save and take a look at your social media links. Another thing you can do is use UTM parameters to measure your social media sources with Google Analytics. UTMs are tags that you add to the links you share on social media which give you more thorough information about the traffic on your page. By using these UTM parameters you will easily determine which social media brings the highest number of visitors to your webpage and in which content they are the most interested in. All in all, Google Analytics is a very helpful tool that can make a huge difference in your knowledge about your customers and potential customers. If used the right way, it can give invaluable insight into your customers’ preferences, their behavior, the purchases, and their behavior after they purchase. And the best thing about it is that you don’t have to have any advanced coding or programming knowledge- everybody can use this tool.